Even the BIS throws the FED under the bus. It is becoming harder and harder to ignore the fact that central banking policy isn’t exactly working out for the real economy. More wealth has been funneled toward an increasingly small and concentrated pool of unproductive paper wealth. But low and behold, it looks like the political-monetary landscape is being groomed in preparation for the next leg of this ongoing train wreck. Now the Bank for International Settlement (BIS), the central bank bank of central banks, is throwing the Fed under the bus. As discussed in detail elsewhere, there is a case that policy should first and foremost constrain the build-up of financial booms – especially in the form of strong joint credit and property price increases – as these are the main cause of the subsequent bust. They are telling us this now? And once the financial bust occurs, after the financial system is stabilized, the priority should be to address the nexus of debt and poor asset quality head-on, rather than relying on overly aggressive and prolonged macroeconomic accommodation through traditional policies. That certainly sounds a bit critical. This would pave the way for a sustainable recovery. I thought recovery was behind us. Or is this a premonition? The idea would have to be macroeconomic policies that are more symmetrical across financial booms and busts so as to avoid a persistent bias that could, over time, entrench instability and chronic economic weakness as well as exhaust the policy room for maneuver. What they mean by asymmetry and persistent bias is the massive concentration of wealth (the bias) tied to an impossibly small pool of real assets, from real estate to commodities, to productive enterprise and precious metals – the asymmetry is inherent in these Ponzis. Here is one very interesting footprint beginning to form as the smoke clears and the Fed reverses its position. While the Washington press corps obsessed over Hillary Clinton’s e-mails at the State Department, reporters were missing a far more important story about government secrets. After five decades of pretending otherwise, the Pentagon has reluctantly confirmed that Israel does indeed possess nuclear bombs, as well as awesome weapons technology similar to America’s. The IDA team added: “It should be noted that the Israelis are developing the kind of codes which will enable them to make hydrogen bombs. That is, codes which detail fission and fusion processes on a microscopic and macroscopic level.” So far, The IDA estimated, Israel scientists were about where the US had been in the 1950s in understanding fission and fusion processes. The report does not include a single declarative sentence that directly states the taboo—Israel has nukes—but the meaning is obvious. For many years, scholars and other experts have estimated that Israel has at least 100 to 200 bombs, possibly more. Some of the IDA’s observations seem to hint at a copy-cat process in which the US government either actively helped or at least looked the other way while Israel borrowed or purloined technologies to establish a parallel nuclear system that looks a lot like America’s. The IDA document does not say anything, one way or the other, on the history of how this happened. But critics of Israel and advocates for banning all nuclear weapons have harbored suspicions for decades. The Institute for Research: Middle East Policy, Smith said, is pushing another FOIA request aimed at the CIA, hoping to pry open long-secret intelligence investigations about how Israel managed to get the bomb in the first place. The institute is seeking disclosure of a CIA study that supposedly investigated how quantities of uranium were leaked or allegedly smuggled by Israeli agents from a Pennsylvania defense plant to provide seed corn for the Israel bomb. Smith and others suspect that elements of the US government knew what happened back then or may even have assisted the stealthy transfer. That particular mystery was a hot issue back in the 1970s. It seems likely to get renewed interest now that the pretense of official ignorance has been demolished by release of the 1987 report. Today we have as a result the “electronic battlefield” and many other awesome innovations. Tank commanders with small-screen maps that show where their adversaries are moving. Jet pilots who fire computer-guided bombs. Ships at sea that launch missiles over the horizon and hit targets 1,000 miles away. I had to read the report several times before I grasped its deeper meaning. The language is densely technological and probably beyond anyone (like myself) who is not a physicist or engineer. The researchers reported on the state of play in electronic optical systems, plasma physics, laser-guided spacecraft, obscure communication innovations and many other scientific explorations that were underway circa 1987. Finally, it dawned on me. These experts were talking in the 1980s about technological challenges that were forerunners to the dazzling innovations that are now standard. I saw some of these new war-fighting devices in the late 1990s when I wrote a short book on the post-Cold War military struggling to redefine itself when it no longer had the Soviet Union as an enemy (Fortress America: The American Military and the Consequence of Peace). The Middle East wars became the live-fire testing ground where new systems were perfected. The consequences of peace were brushed aside by the terror of 9-11. War became America’s continuous preoccupation. On several occasions, the research team spoke of “ingenious” or “Ingeniously clever” solutions that Israeli technologists have found for mind-bending problems of advanced physics. The IDA team also suggested opportunities for American researchers to piggy-back on what Israel had discovered or to team up with one of their R&D centers. Yale’s Office of Naval Research, IDA suggested, should collaborate with the Hebrew University of Jerusalem. Bibi Netanyahu came to America to remind Members of Congress that they work for him and Israel, and better torpedo President Obama’s upcoming treaty with Iran or else they will never be re-elected. The truth about Israel attacking America on 9-11-01 is now spreading like wildfire around the World and diffusing throughout American populace. Once a critical mass of 12% is reached, you will be amazed at how this big 9-11-01 CMMM coverup unwinds. Soon all true Americans will want payback and will drive out the Khazarian Mafia (KM) and their crooked Counterfeit, fake Rothschild private Central Banking System. From pending passages of open carry and campus carry to legislation that completely repeals any need for a concealed carry permit, the gun control lobby is getting rocked. According to HuffPo, one the clearest losses for the gun control lobby is the open carry push in Texas. That fight is one which HuffPo has already written off as a done deal, and one which they presume will quickly be followed by campus carry. Arkansas, Florida, Nevada, and 10 other states are also considering changing their concealed carry statutes so women can carry guns for self-defense on college and university campuses. On top of this, the West Virginia legislation voted to do away with any concealed carry permit requirement, the New Hampshire Senate did the same, and Maine is working on it. Montana lawmakers are also pressing to do away with any remaining requirement for a concealed carry permit in their state, and the same repeal has been introduced in Idaho. This all comes less than a year after Kroger, Fred Meyer, and Harris Teeter all rejected Moms Demand Action’s calls to deny law-abiding citizens their right to openly carry guns for self-defense in their stores. It comes less than six months after Moms Demand Action founder Shannon Watts tried to spin her group’s huge mid-term election losses as proof that they’d become a “political force.” It comes less than a month after their West Virginia chapter begged lawmakers in that state not to repeal concealed carry permit requirements. And all of it is compounded by their continued, unpopular opposition to arming women for self-defense on college campuses. 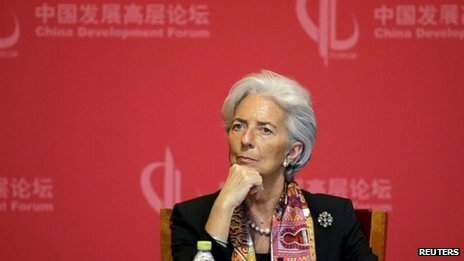 International Monetary Fund chief Christine Lagarde has said the IMF would be “delighted” to co-operate with the China-led Asian Infrastructure Investment Bank (AIIB). The AIIB has more than 30 members and is envisaged as a development bank similar to the World Bank. Mrs Lagarde said there was “massive” room for IMF co-operation with the AIIB on infrastructure financing. The US has criticised the UK and other allies for supporting the bank. The US sees the AIIB as a rival to the World Bank, and as a lever for Beijing to extend its influence in the region. The White House has also said it hopes the UK will use “its voice to push for adoption of high standards”. Countries have until 31 March to decide whether to seek membership of the AIIB. As well as the UK, other nations backing the venture include New Zealand, Germany, Italy and France. China established the Asian lending institution in 2014 and has put up most of its initial $50bn (£33.5bn) in capital. Now that current events are confirming the analysis which has been developed here over the last year and 2 months, it’s time to move forward and understand the broader ramifications of what these changes will mean for the monetary world. There have been numerous proclamations over the last few years in regards to the irrelevance of the International Monetary Fund and the SDR – Special Drawing Right. Now that it has been officially announced by both China and the IMF that the yuan will be added to the SDR composition by the end of this year (stating that they are in discussions is tantamount to a confirmation of such), the conspiracy theories and faulted analysis of the BRICS countries overthrowing the IMF and World Bank, and by default America, should be tossed in the trash bin where they belong. It has been repeatedly stated here that neither China, nor the United States, want the added domestic pressure of using their respective currencies as the global reserve unit of account. Yet, the US Congress has failed to ratify the 2010 IMF Quota and Governance Reforms. Reforms, which will restructure the IMF Executive Board and quota system, leading into the systemic framework changes to the international monetary system. Treasury Secretary Jack Lew stated yesterday that America is beginning to lose influence in the world, along with veto control in the global institutions which it has dominated since the end of WW2. The Plan B reforms which the G20 and IMF announced earlier in the year are now materializing in the form of the exodus by European countries to the Asian Infrastructure Investment Bank, and the ongoing discussions between Ukraine and Greece with the eastern powers of Russia and China. The SDRM – Sovereign Debt Restructuring Mechanism, meme and media representation is beginning to pick up momentum. As each region and country falls further into economic deflation, and as the world enters the final stages of deleveraging from the expansion of debt which culminated in the financial crisis of 2008, the obvious nature of the multilateral architecture will become more clear. The statistical research which has concluded, and been pompously presented as the collapse of the USD and the rise of a new gold standard, or trade system, is inherently flawed in that it’s analytical baseline is positioned upon past economic data. This is the same data which has led most analysts off track from the slowly rising framework of the multilateral SDR system. Whether it’s QE policies, ZIRP, NIRP, or the migration of gold, no economic model has accurately predicted the full transition because the transition segments, such as the QE deleveraging, can not be referenced and understood on old economic data and models. The Group of Thirty is a non-profit organization which is mandated with restructuring the international monetary system, and it’s members are a list of the top central bankers and economists in the world. These are the people making the decisions and engineering the multilateral framework. America, China, Russia, Europe, and all other prominent country’s and regions are represented on its board. Occasional Paper 87 from the Group of Thirty (G30), published in May, 2013, titled Debt, Money, and Mephistopheles, makes clear plans for the “redesign of financial regulation and macroprudential policy” to prevent another crisis like the one in 2007. The paper goes on to describe how a “combination of macroeconomic and macroprudential policies are needed to navigate against the deflationary headwinds created by post-crisis deleveraging“. From this policy paper the purpose and intent of the QE strategy is clear. Presenting QE as leading to the collapse of the monetary system is not representative of its purpose and design. When we extrapolate this knowledge into the vast amount of analysis and predictions which have been offered up over the last few years, we begin to realize the error in relying on old economic data and models in attempts to determine future outcomes. This is why most analytical predictions will not be realized. These distortions will degrade the predictive value of a statistical model, leaving both writer and reader floating freely in the make believe world which relies on past data. Data which does not take into consideration the fundamentals and macropudential mandates of the multilateral transition plan. There is much talk of a Black Swan Event in the economic and geopolitical worlds. This concept has been used by endless analysts and columnists as the emotional content in essays and blog posts. The Black Swan Event, we are told, will lay waste to any plans which may be in the works, and lead the world into years and decades of depression, and/or war. But lets take a closer look at this concept, and the probability of something of this caliber actually taking place. JASON, a study group division of the MITRE Corporation, completed a Rare Event study in October, 2009. This study analyzed and measured the probabilities of 9/11 magnitude events. Based on the methodologies used in the study, it was concluded that between the years 1968 and 2006, there was a 23% probability of a 9/11 magnitude event. Obviously there was such an event, and the probability was still less than 50%. Based on the same baseline data, the group determined that the probability of such an event between 2009 and 2019 is 7%. We frequently encountered references to “Black Swans” in our study. The Black Swan metaphor was popularized by a recent book The Black Swan: The Impact of the Highly Improbable by Nassim Taleb . The metaphor has clearly had great impact on how people are thinking about rare events, so we considered Taleb’s argument carefully. Taleb’s argument is that many high-magnitude rare events (Black Swans) are fundamentally unpredictable, and that efforts to predict them are futile, dangerous, and even intellectually fraudulent – particularly when using statistical models based on past observations, and especially if the statistical model assumes Gaussian variance around some mean event size. His term “Black Swan” is a reference to a (supposed) European belief that all swans were white until black swans were discovered in Western Australia in the 1700’s. Black swans came to be used in philosophy as an example of a logical failure of inductive reasoning – that is, just because all previously observed swans are white does not necessarily mean that the next swan will be white. Taleb makes important points but carries his argument too far. It is unfortunately true that some mathematical models for risk forecasting assume Gaussian variance despite substantial countervailing real-world evidence. Taleb’s criticism of economic risk models (such as the Black-Scholes-Merton options pricing model, which assumes that market prices make Gaussian-distributed moves) is particularly poignant given the world’s current economic situation. But though this is damning criticism of specific models’ faulty assumptions, it is not a damning general criticism of the careful use of modeling to help predict risk. What we can take from all of this is that the probability of a 9/11 magnitude event is marginal at best, and the probability of a Black Swan Event is even less so. The use of the term is out of proportion to the realities taking place in the monetary infrastructure. The analytical conclusions which call for such an event, along with the collapse of the dollar, and global depression, are inaccurate because they are based on old economic models which haven’t accurately considered the changing dynamics and architecture of the emerging multilateral, such as the designed deleveraging purpose of QE policies.